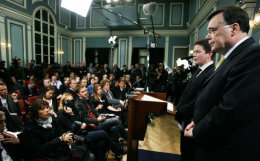 The Icelandic Prime Minister Geir H. Haarde held a press conference this afternoon reacting, amongst other issues, to the speech of Gordon Brown, his British counterpart, from yesterday afternoon. Haarde said that he received a letter from Gordon Brown earlier today clarifying his government’s approach. Haarde then called Brown’s earlier public remarks unfortunate, but claimed that they are mutually working on clarifying the current situation. Haarde also stated that Icelandic authorities will investigate whether it was legally justifiable for the UK government to overreact in the way it did, especially when Gordon Brown stated that Iceland was bankrupt. “That was not the case and strong words like that would never help,“ Haarde said. Teams of UK and Dutch officials are coming to Iceland tonight and talks with their Icelandic counterparts will be held over the weekend. Jens Stoltenberg, the Norwegian Prime Minister got in touch with Geir Haarde and staved off the speculation that branches of Icelandic banks in Norway are not willing to help to solve the situation. Stoltenberg, as Haarde stated, restated Norway’s friendly offers of cooperation throughout this crisis in finding the best possible solutions to the present situation. When asked about the commitments to IceSave, Haarde replied that Icelandic government will honour their obligations, but that they needed UK support. “What needs to be done from the Icelandic side now is to look into the extent of using Landsbanki assets,” he said and assured that the claim of the depositors is the priority. In fact a law was passed today to ensure this. Haarde also sympathised with the former employees of Landsbanki who have been laid off. The large lay-offs were a precaution measure, and some may be kept on. “We will do our best to keep unemployment down,” he said and added that unemployment in Iceland is usually around 1 – 2%. The government intends to do its utmost to create new jobs for the people who lose their jobs due to this financial crisis. The market will pick up as soon as the flow of foreign currency is restored. Listen to the press conference in Icelandic followed by English here. Like	. Dislike	. October 11, 2008, 2:41 pm . An Icelandic MP Guðni Ágústsson has come up with the idea that Iceland should sue the UK as Gordon Brown froze the assets of Kaupþing, Kaupþing was expected to survive the crisis but the UK basically forced them into the position Glitnir and Landsbankinn are now sitting in. The whole situation has been blown out of proportion and the blame has to go with Gordon Brown. Geir H. Haarde for all his faults is no doubt over worked, stressed, working hard at resolving this crisis and having to deal with all types of questions. He never said once that foreign investors would not get their money, He said his main priority was with the Icelandic State and people at present. Some of the comments on this site have been nothing but disgraceful from Brits calling Icelanders thieves being one of the lighter insults. The British team have arrived in Iceland to discuss the options with the Icelandic financial experts, this issue will be resolved, that I am sure of. Brown is failing as a PM and needs to look hard and tough on the big stage. Labour are unpopular, I’m originally from Scotland where we have a SNP government who are running the country(Scotland) with a minority government in Edinburgh 10times better than the Labour-Lib Dem coalition did for 8 years of Devolution, Brown is under pressure, The Tories are ahead in opinion polls, he is disliked by his own people and when Scotland has an Independence referendum in 2010 or 2012, I really think we will put the last nail in the coffin of the 300 year old outdated political Union. Trying to act tough Gordon so people in Britain will think he stands up for them to a country of 300,000 people who are suffering from a huge financial crisis which could bankrupt the nation, he just looks like a Bully. I’ve lived in Iceland in 3 years and this country will rise again from this mess, 99% literacy rate, educated, enthusiastic, hard working young generation who are creative, streetwise and family orientated will help all Icelanders through these heavy times. Like	. Dislike	. October 11, 2008, 1:02 am . What a joke. You steal British and Dutch money while allowing local Icelanders to continue to bank. This is nothing less than theft. Then you say that you will not honour an agreement to protect the first 20000 euro of deposits. Then you say that you will not protect depositors. You my dishonourable friend the Icelandic PM, have no integrity. You deserve the contempt of the rest of the world. Your business dealings and behaviour will guarantee that no one will trade with you in future. Like	. Dislike	. October 10, 2008, 7:52 pm . This crisis, a theft of assets by fools with no thought for care of others, reminds that Iceland has produced a great reformed sinner, Hallgrimur, but never a Thomas Jefferson or Comenius, the Czech bishop who set up Scandinavia’s education system in the 1600s. A society founded in slavery and violence despises speaking freely. Clever liars are prized. A slick cheat seems better than creating enduring honest value in a genuine community life. So the Vikings show their values. A return to pillage and theft. So it goes. What is the quality of the shared? Honest life works best in love, life and trade. Like	. Dislike	. October 10, 2008, 6:28 pm . I am a British National and am ashamed at my Government and Prime Minister. Believe me, he is tying to deflect the blame of his 10 years of mismanagement. Icelanders and British and the same, we are Islanders, and we should stick together. In times of trouble we should stand together and not pass blame. I am sorry for the discgraceful actions of Gordon Brown. Like	. Dislike	. October 10, 2008, 6:27 pm .